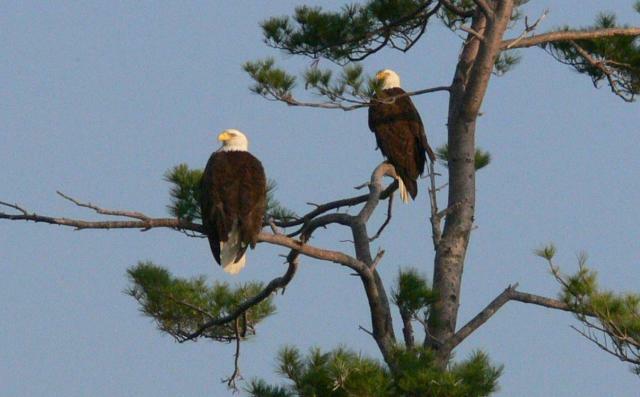 A beautiful pair of bald eagles has been nesting just North of us at Squam Lake for 13 years running. 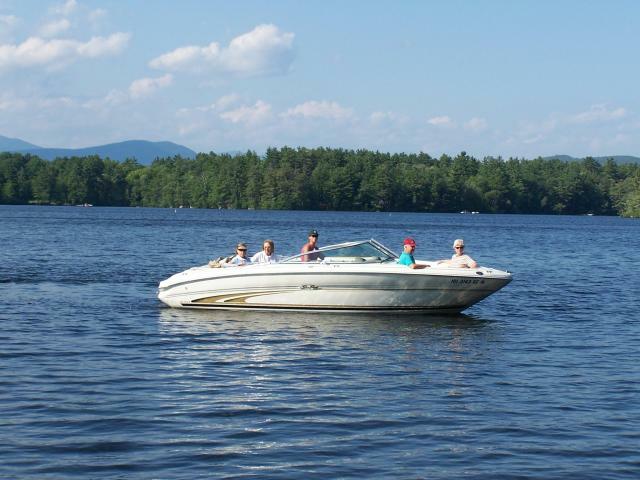 Consider adding this once-in-a-lifetime opportunity to your Lakes Region vacation agenda! The wildlife in and around our lakes is diverse and abundant, but nothing causes quite as much excitement and stir as spotting our famous pair of nesting bald eagles! It is an absolute favorite among our guests, with folks talking about their experience and memories for years to come. If you are planning a trip to The Lake House at Ferry Point or are visiting the Lakes Region, we highly recommend that you consider booking a tour to see these beautiful creatures in their native environment. You may even get a sneak peak at one of their chicks or fledglings in the Spring if you’re lucky! As our national bird, bald eagles are the epitome of American pride. These majestic birds, which mate for life, were put on the endangered species list back in 1995. Thankfully, due to aggressive conservation efforts, they made a comeback and their numbers continue to grow in New Hampshire and other indigenous areas. In fact, in 2007 they were removed from the federal endangered and threatened species list. They are still listed as threatened on the NH state endangered and threatened species list, but studies show very encouraging results. The NH Audubon recently completed its annual Midwinter Bald Eagle Survey with a new state record high of 90 bald eagles counted in one day. This is a 34% increase over last year, when observers counted 67 birds! This trend is promising for conservationists who have been tracking eagle populations since 1981. Over the last decade, the NH population growth has been extremely robust, doubling roughly every 5 years. Our pair of bald eagles arrived at Squam Lake in 2003 to nest and successfully fledged one chick that first year. The pattern has continued for the last 13 years, with almost 20 chicks having hatched. We have experienced a few scares over the years — in 2007 the pair used an alternate nest on Long Island, but did not successfully produce chicks. Then in 2013, the nest failed due to extremely cold weather and ice. This year, the pair is back and getting their nest ready to mate again. Having these birds breeding in their natural habitat and so close by is beyond exciting. We have even been lucky enough to spot a bald eagle in a tree at our next door neighbor’s house next door! If seeing bald eagles get you just as excited as us, we have a great recommendation for you. Come stay with us this spring and book an Ultimate Spring Excursion with our friends over at Experience Squam. The Experience Squam Ultimate Spring Excursion features a scenic tour of the lake during the best time for viewing our nesting pair of bald eagles. Participants often see mergansers, blue heron, cormorants and groups of loons gathering. With luck, you might even see a flight school expedition for the young loons learning to fly! Large groups of migratory birds often stop to rest along their journey south, which can be a spectacular sight. You will tour historic Church Island, stroll along the Chamberlain Reynolds boarded swamp walk and see sights from scenes in the movie, On Golden Pond. I think we have all had enough with this winter, so let’s make a date to enjoy some spring weather and celebrate our beautiful bald eagle family! If you would like to book a spring stay with us at the Lake House at Ferry Point, check out our rooms and view any current special offers.